When times call for quality over quantity, Bud Light just doesn’t quite cut it. As craft beer explodes across the country’s bar scene, it can be pretty pricey to support our local breweries. A pint of Indianapolis craft draft beer usually costs around $5. Maybe $3.50 on a good night. And while buying them in cans or a six-pack can be cheaper, it still comes out to about $2.00 per pint. While this doesn’t seem like much, we all know how a few beers at the bar can add up. Luckily most breweries offer the option to fill a giant 64 ounce jug with their beer for a pretty low price aka a growler fill. In Indy, a Sun King growler fill can get as low as $1.25 per pint. PLUS you can fill them on Sundays. That Indiana law may change til next football season, but a growler could be your next hero on that empty-fridge summer Sunday cookout. I decided to give my brother a growler from Sun King (a Indiana brewery with Wabash ties) that he could fill in Chicago. To make the barrier to entry even lower, I made him a guide with location, hours, pricing, and specials. It took awhile to dig up the info, which is why I want to share it with the world. 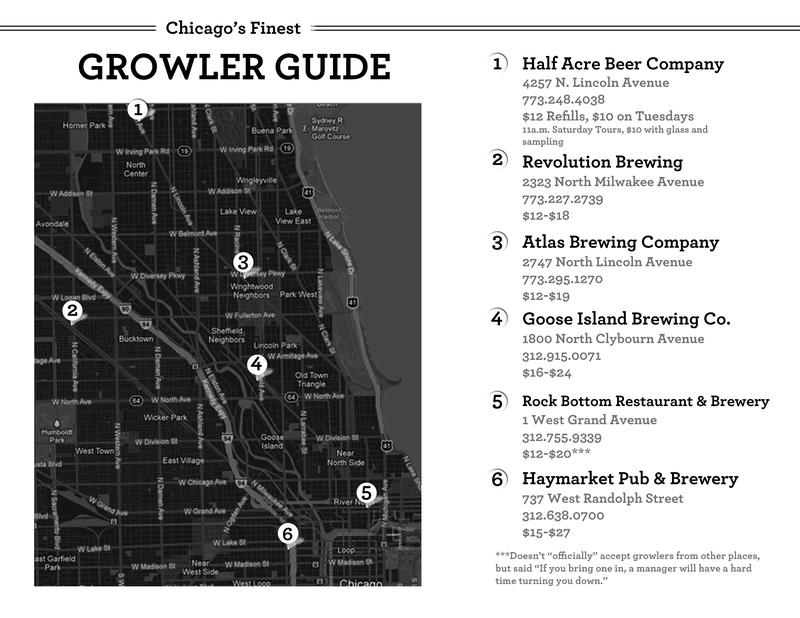 So if you’re someone in Chicago that’s ever wondered, “Where can I get a growler filled in Chicago?” look no further. You’ve found the treasure map you’re looking for. Click the image below and print it from your browser if you like. Any of the locations above will fill any growler you bring in as long as it has the surgeon’s general warning on the back (except Rock Bottom – you may have to do a little negotiating). Stay tuned for the Indianapolis version. That one will probably be more extensive, and hopefully with the lowered cost of living!